Tripoli clashes highlighted by UN humanitarian agencies (Photo: UN OCHA). Heavy armed clashes and artillery shelling on residential areas in Ain Zara and Khallat al-Forjan have translated into an upsurge in displacement numbers in and around Tripoli, which doubled over the past 48 hours to just over 6,000 individuals, the UN Office for the Coordination of Humanitarian Affairs said in its latest report yesterday. It added that if violence were to continue and fighting were to reach the more populated areas of Tripoli city, further large-scale displacement has to be expected. There are concerns for the protection of civilians and first responders amidst reports of the deaths of at least three medical staff. Due to ongoing conflict, access restrictions and indiscriminate targeting of first responders, only 58 out of 580 families who registered for evacuations from areas particularly affected by hostilities could be brought to comparatively safer places to date. The United Nations continues to call for a temporary humanitarian truce to allow for the provision of emergency services and the voluntary passage of civilians away from areas of conflict. The report said that about a week into the eruption of clashes in Tripoli, local teams responsible for the evacuation of civilians from conflict-affected areas have received requests for the relocation of some 580 families (around 2,900 individuals) to comparatively safer areas. However, due to access restrictions, hostilities and indiscriminate targeting of first responders, the teams have only been able to respond to 10 per cent of all requests, evacuating just 58 families. Most cases of civilians trapped in proximity to the fighting have been recorded in areas in the south-western and eastern outskirts of Tripoli (such as Wadi Alrabee, Al-Ahyaa Al-Beria, Aziza and Souq al-Khamis) and greater Tripoli (the ElKeheli neighborhood of Ain Zara). Families who remain stranded inside conflict-affected areas report to not only fear for their safety, but also to slowly run out of fuel and food. The report added that emergency service providers are conducting life-saving interventions amidst ongoing hostilities at great personal risk, with reports of three doctors having been killed, four first responders having been injured, and one ambulance driver having been kidnapped. Members of the evacuation teams have issued an urgent call for a provision of bullet-proof vests and helmets to protect their staff from harm whilst on duty. 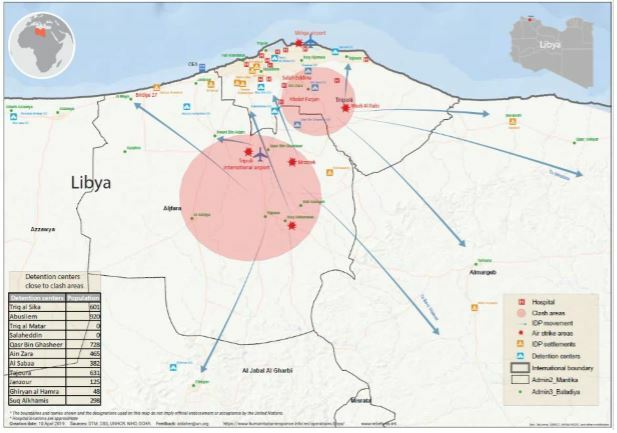 The report informs that key IDP reception areas are located in the neighbourhoods of Tripoli, Tajoura, Ain Zahra and Al Maya, while fewer families are settling in Swani, Janzour, Tarhuna and Bani Waleed, amidst others. It explains that most IDPs continue to settle with family members and acquaintances. At least twelve collective shelters have been set up across various areas of Tripoli. The four main municipalities in central Tripoli are currently working to identify four additional spaces for collective shelters, as they anticipate that the shelters in northern Ain Zara and Tajoura will soon need to be evacuated due to shifting frontlines. Field hospitals in conflict-affected areas report a dire need of medical staff on the ground, with reports emerging that many medical facilities are only staffed by one doctor, on 24-hour shifts, at a time when the medical caseload is rapidly increasing. Medical supplies are running low, and urgently need to be replenished. The report says that the United Nations continues to call for a temporary humanitarian truce to allow for the provision of emergency services and the voluntary passage of civilians, including those wounded, from areas of conflict.